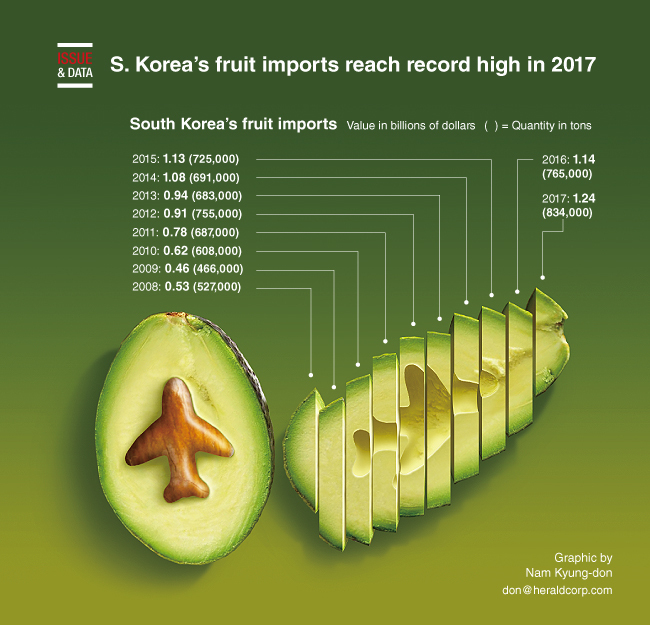 South Korea's fruit imports reached record-high levels last year on the strength of growing demand for greater variety in food choices, customs data showed. The country imported 834,000 tons of fruit, worth $1.24 billion, last year. In terms of value, last year's figure marks the highest tally ever, according to the data compiled by the Korea Customs Service. In the first seven months of the year, fruit imports stood at $1 billion, also up 7.6 percent from a year earlier. The popularity of avocados rose sharply in Korea, with imports reaching $30 million. Mango imports were tallied at $50 million, the data showed.